Granite Hill Camping Resort is nestled on an 150-acre property in beautiful Adams County. As such, Granite Hill has a long and varied colonial and agricultural history. Prior to 1964, the land on which Granite Hill Camping Resort is situated was exclusively a working farm. And, the property is contained entirely within the boundaries of the Manor of the Maske, which was William Penn’s familial holding in the area. The original owner of Granite Hill was David Stewart, who settled in what was then York County sometime during the great influx of Scotch-Irish, Dutch, and Catholic settlers during the period 1733-1740. Mr. Stewart’s name appears on several historical documents and his final resting place is the Lower Marsh Creek Cemetery, a scant few miles from Granite Hill. The Stewart name remained attached to Granite Hill for more than a century. Ancestor David Stewart is recorded as owner of several properties, including Granite Hill during the Battle of Gettysburg and his name is also listed in a request for war reparations from the Confederacy. Following the Civil War, David Stewart sold Granite Hill to Felix Drais in 1865. Reason given for the sale of the family lands was the “overcrowding” of Adams County and he was rumored to have moved to the frontier territory of Missouri. Felix Drais was a Union soldier from Ohio who was wounded in the Peach Orchard on the second day of the Battle of Gettysburg. He convalesced in Gettysburg, married his nursemaid and returned home to civilian life in Ohio. Evidently, homesickness on his wife’s part forced his hand and he purchased Granite Hill from the Stewarts and returned to Gettysburg to live out his days. Not much is known about his offspring but his grandson, Jim Lott, was to play a crucial role in the history of Granite Hill. Jim Lott grew up at Granite Hill and actively participated in the family farming operations. When his grandfather, Felix Drais, passed away Granite Hill came into his possession. He continued to operate the farm for decades but found farm life increasingly difficult to manage, as his children had no interest in farming. It was during this period that the seeds of Granite Hill Campground were sown. Jim needed additional farm labor so he took advantage of government programs, which transported city folks to rural communities to experience agricultural life. The rural communities benefited from additional hands around the farm during critical periods. Additionally, Jim was a noted square dance caller and would host dances in the barn on a regular basis. Folks would come some distance for the dances, which would often last late into the night. Some asked Jim if he would mind if they pulled a camper and spend the night on the property. To their surprise, the next time they asked, Jim informed them that he had “run a few electric lines to the woodlot next to the old hand pump well”. Granite Hill Campground became the first campground developed in Gettysburg. Jim subsequently assisted farmer friends of his in the development of additional campgrounds in Gettysburg. In 1972, Jim sold Granite Hill to Joe & Lil Cornett of West Chester, Pennsylvania. The Cornett’s presided over the development of Granite Hill from an active farm with a campground on the property to a full-fledged camping resort. They added a swimming pool their first full season and founded the Gettysburg Bluegrass Festival in 1979. In 1980, the Cornetts opened the Granite Hill Waterslide, which was replaced in 1997 with Granite Hill Adventure Golf. Along the way, many improvements to the facility were undertaken, both large and small. 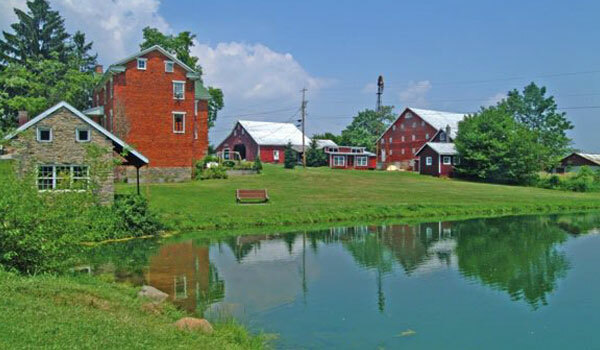 In 2002, at the time of the sale of Granite Hill to their daughter and son-in-law Cyndie Cornett Winkelmann and Rich Winkelmann , Granite Hill’s 150 acres were home to 300 sites and a internationally acclaimed bluegrass festival that had been running for over twenty years. Rich and Cyndie were excited to make their own mark in the history of Granite Hill and did so by implementing a computerized reservation system and embarking on a multi-phase infrastructure improvement project in 2003. In 2005 they started the Gettysburg County Day Camp. 2008 saw the opening of the Granite Hill Bed & Breakfast in the old brick farmhouse. In 2010, Granite Hill offered WiFi and Cable TV to their camping and bed & breakfast guests for the first time. In 2016 camping pets saw the opening of Ivy’s Pet Paradise a dog park located by the Adventure Golf course. In 2017 Rich and Cyndie are excited to celebrate 45 years of camping history at Granite Hill, as well as, the 75th Anniversary Gettysburg Bluegrass Festival August 17-20, 2017! The years to come are sure to witness more improvements as Granite Hill continues to make history and memories for both owners and guests alike. And, by the way, they still farm on a portion of the property, just like every owner since the 1730’s. Your hosts at Granite Hill Camping Resort are Cyndie and Rich Winkelmann. Cyndie and Rich are both Gettysburg natives, having been raised in town and matriculated through the local school system. Cyndie attended Franklin & Marshall College where she majored in Accounting and minored Art. Rich attended Swarthmore College and Gettysburg College where he majored in Environmental Science. Prior to purchasing Granite Hill in 2002 Cyndie worked as an accoutant in Lancaster, Philadelphia, and Harrisburg. Rich was an Information Technology Specialist for the United States Department of Agriculture in Harrisburg. While they rely heavily on their management team for daily operations, Cyndie and Rich are both actively involved in the running of Granite Hill. Cyndie oversees the Administrative side of the business while Rich is responsible for Operations & Maintenance. Rich and Cyndie are also the promoters of the Gettysburg Bluegrass Festival. Maintaining an active lifestyle continues to be a priority for Cyndie and Rich. Cyndie continues to be an avid runner and is a veteran of 15 marathons. Most recently, she completed the 1st Annual Gettysburg Battlefield Marathon in Gettysburg hosted by the Adams County YWCA. Cycling is Rich’s passion and he can often be found on his mountain bike in the Michaux State Forest, which is only a few miles from the park. When not riding or racing his bike, Rich promotes one of the longest running mountain bike race series on the East Coast, the Michaux Endurance series. In the off-season look for the Winkelmann family on skis and snowboards anywhere there is snow, but you’ll often find them at the local ski hill, Liberty Mountain Resort just 3 miles from Granite Hill! Cyndie and Rich live in Gettysburg with their two daughters.